Unemployment numbers are down, but there are 220,000 military veterans who are still looking for work. Though these vets are having a tough time finding jobs, they’re actually well equipped to work in the tech sector — many vets are skilled in computer security, SQL and troubleshooting, which are good reasons for hiring veterans. Some employers are reluctant to hire those in the National Guard or Army Reserve, due to the required time off for service or training. But these employers could earn a tax credit upward of $9,600 for hiring veterans. These tax credits and an improving job market could help the American economy achieve First Lady Michelle Obama’s goal of hiring 100,000 veterans and military spouses by 2014. Tech companies such as Microsoft and Google have stepped up to the plate thus far. 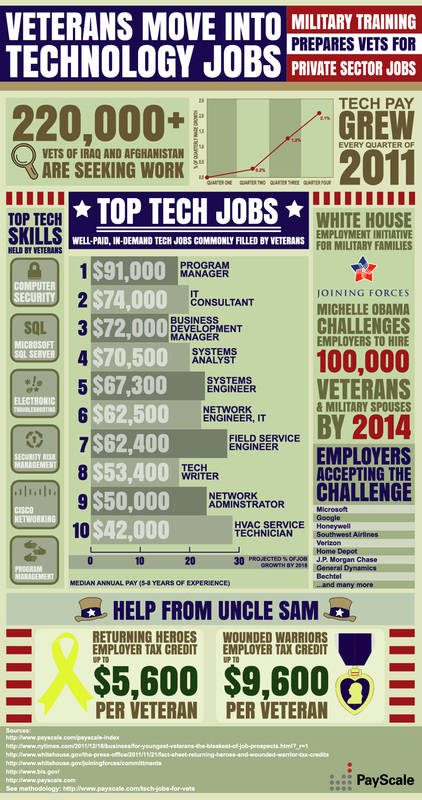 The infographic below, produced by Payscale, points out tech jobs commonly filled by veterans, lists common skills of veterans and shows why veterans are a good fit in the tech sector.